Edible fruit of Passionflower plant. Passiflora incarnata, is used in beverages, jelly, jams and desserts. Traditional Native American and American folk use of the tea made from the leaves as a remedy for epilepsy, insomnia and nervous conditions. Passionflower plant is native to tropical South America and is adaptable to most soils and positions. Drought and frost tender. 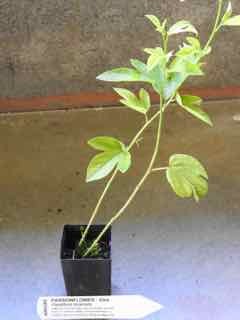 A perennial, woody vine, growing to a length of 10m. Be the first to review “Passionflower, plant” Click here to cancel reply.